On the 27th November 2018, I visited Chrysalis Manchester an organisation that supports local African and migrant residents through education, welfare advice and health support, and part of the Online Centres Network. The centre is based in the heart of Moss Side, which was renowned for being an area that was plagued by crime activity in the 90s. Fast forward to 2018 and the area has changed vastly, seeing a decrease in crime rate and an increase in community cohesion. One of the organisations at the heart of this amazing transformation is the Chrysalis Centre. The centre itself has been open for over 25 years and the centre manager who was part of the setup is still currently running the centre. Julie Asumu, who originates from Nigeria, has been a stalwart for the Chrysalis Centre, alongside 'true community person' Rebecca Asgill, the forefront worker who deals with day to day classes such as English My Way. On my visit I straight away detected the passion and the vibrant atmosphere present in this community. Observing the English My Way session showed me the great mix of diversity - the class had migrants that hailed from several different continents. Inspiring, cheerful and passionate are just a few of many adjectives I could use to describe these learners. As I observed the lesson, I found that the learners were engaged and focused. I spoke to a learner who originates from Pakistan, and she told me that without the English My Way programme she would struggle to integrate and would be totally dependent on a translator on simple task such as talking to teachers. I, myself can understand and empathize with this since my parent were migrants from Kashmir and completely struggled with the English language. My mum was fortunate enough to have a tutor paid for in the 1980s, but many others didn't have this opportunity then and wouldn't have had the money to pay for tutors in any case. The English My Way programme is provided to local communities for free, which means so many more people can have the opportunity that they wouldn't have had many years ago. I found my visit refreshing and captivating, and it gives me a real belief that many centres in the Online Centres Network are following similar paths. I am so happy that Good Things Foundation can support the network to help people to learn English in this way. 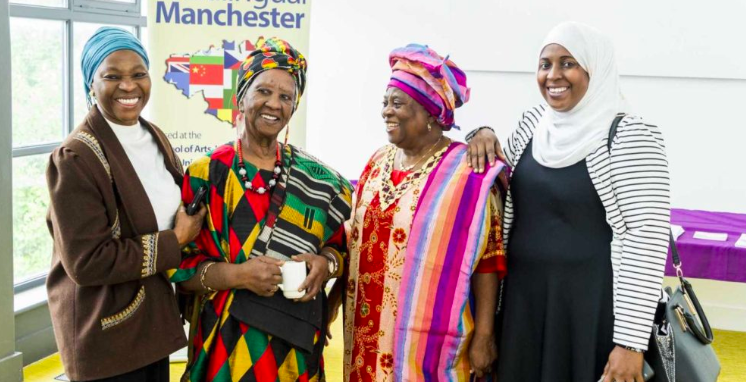 Chrysalis Manchester, based in Moss Side in Manchester, was established to provide benefits for their local African and migrant residents through education, welfare advice and health support.